Are all vinyl replacement windows created equal? Not at all! Just as there are many different makes of cars & trucks, so there are many different brands of windows. Rager Home Improvement uses well recognized window names such as Simonton to insure quality and factory warranties. Are they difficult to clean? No more ladders! All of the double hung units tilt in to clean for safe and easy cleaning. Even the casement window can be cleaned on both sides from the convenience of the interior of your home. Double or triple pane glass is a great deterrent to any criminal. There are also security locks which will allow the window to be opened a few inches for ventilation while you are away or asleep. Some of my woodwork is painted and some is stained - can they be matched? We have a wide selection of colors and wood-like stain finishes on the windows. No more painting or staining ever needed! What does "Low-E/Argon" gas do for the performance of a window? This specially treated glass has several functions. It reflects heat. In the winter time it helps to reflect the needed heat back into the room and in the summer it helps to reflect heat away from the window. Now your house can be warmer in the winter and cooler in the summer! The Low-E glass also helps reduce the harmful affects of the sun's rays which can fade carpets, furniture, and curtains. The Argon gas makes the "dead air" space between the panes of glass more dense. This increases the high performance of the insulated glass. All of our well recognized products come with either life time or pro-rated guarantees. Whether it is Simonton, Mastic, or Masonite you are dealing with companies that stand behind their products. Rager Home Improvement, Inc. also will be there to help with any questions. Any labor related problems with any of our products are guaranteed for a full five years! Plus the warranty of the products themselves is just another reason why Rager Home Improvement, Inc. has been serving the Van Wert area for over 55 years. We have always and will continue to service our customers. 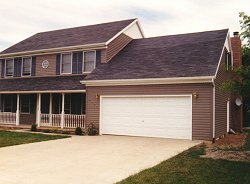 Why choose vinyl siding over metal siding? Vinyl will not dent, scratch, or peel like metal siding can. It will help keep your home warmer in the winter and cooler in the summer! Does the original siding have to be removed before new siding? Normally not. We use Dow foam board insulation over the existing siding to help prepare the walls for the new siding. This insulation board helps to plumb the walls as well as add extra insulation value. If I replace my old windows, will the interior & exterior be disrupted? Not at all! That is what is so nice about our replacement window system. 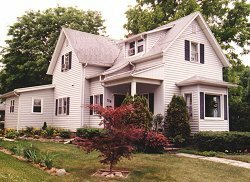 We use the same opening of the existing windows and custom order your new windows to fit without disturbing the interior walls and exterior siding or brick. What about all of the old materials, clean up, and building permits? Rager Home Improvement, Inc. takes care of all of this with no extra charge! How can I get a FREE estimate?